Singing and Spinning: My First Award! Thanks Carol. Wow, I am so excited to receive my first award. Sunday night, when I got the email about Carol's comment. I was so excited I wanted to sit down and write a post about it. But, it was really late at night so it had to wait. Carol, from Songberries, gave me this award. You should go over and check her out. She talks about her family, her dog and her brand new puppies, about cooking and crafts and tips. Be sure and check it out. 5. Share the love and link to this post and the person who nominated you for the award. Tell us how you've come to have an attitude gratitude. I have so very much to be grateful for. I am actually very overwhelmed by this award and the opportunity to share what I cherish and what swells my heart and soul. My greatest blessing is to know that Christ's Atonement has made it possible for me to spend forever with my wonderful family. I can't imagine a day without hearing my little girl's voices and their sweet giggles, seeing my husband's big gorgeous smile, or a day without the love and support of my family that Scott and I are raising together and the family that raised me. On Sunday, our lesson was on adversity and more importantly, how we may feel abandoned at our most difficult times but that we are not alone. Even Christ as He was on the cross, dying for us, He called out to God for forsaking Him. This lesson really made me think about how blessed we are. Today I feel like I can look at my future trials and know that because of Christ's Atonement, we can get through anything. I know that the Lord loves us and will help us through the challenges (whatever they may be) and most importantly, we WILL learn from each of our trials. We will be a closer family and will learn to lean on one another and be there to lift each other up. The challenge will be remembering this when in the midst of adversity. I am so grateful for every day that I get to spend with Scott and the girls. I love them each so much and love the difference in each of their personalities. It is delightful for me to see which of my traits and which of Scott's traits each of the girls has now and which will stay with them forever. Even when there have been horrible days, in the end, these three are what get me going in the morning and keep me going all day. When I have to travel for work, I long for the moment that I get to walk in and give my girls "huggies and kissies." My family is my reason for everything in my life. They are my joy, my sorrow, my light, my dark, my loves through good and bad. I was raised by wonderful parents and grew with fantastic siblings. They are my best friends and always will be. I love you all. That is what I am most grateful for (and for this award that helped me share). Thanks for the posted! I loved what you wrote! You really are an amazing friend! Thanks for the award too!!! Thanks Amy! It is my first blog award too. We have been out of town, so that is why my blog has been dormant. 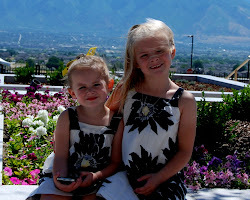 I was in Utah for a while, but it was sooo hectic with family stuff that I didn't get to visit with any friends. Sorry I missed you this time. When I come in the fall or winter, things aren't so crazy. I will catch you next time. Thanks again for thinking of me.